Great success for hosts and competitors. On 14 February 1952 Princess Ragnhild welcomed 700 competitors from 30 nations to the Sixth Winter Games. 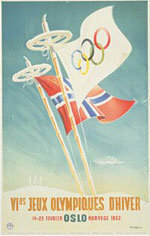 Many important buildings were put up in connection with the Games: The student town at Sogn, the staff housing at Ullevål Hospital, Ilagløtt housing for the elderly, Jordal Amphitheatre and the Viking Hotel were all a result of the first Norwegian Olympic Games. The Games were a success, with over 500,000 spectators. Hjallis was the great Olympic champion with his three skating golds.